The rhythmic clanging of protesters banging rocks against metal shutters, interspersed with the crack of gunfire, warns that you are near the frontline. Dense clouds of suffocating and burning gas fill your mouth, nose and throat. The ground is littered with broken rubble and smouldering fires. Fear of losing your eyes to shotgun pellets slows forward movement. After seeing friends carried away with blood streaming from their lids, you stop trusting the goggles. This is Mohamed Mahmud Street, leading east from Tahrir Square in downtown Cairo. Lines of police are attempting to assault and clear the sit-in occupying Tahrir. Blocking their way are the ‘ultras’ (organised football fans), leftist activists, students and many from the slums of Cairo in tracksuits and flip flops. Most are men, although women are noticeable – some wearing the niqab and throwing stones, others with long, flowing hair carrying crowbars. With each crack of the police shotguns, two or three people drop around us. We load them onto a waiting motorbike, and others take their place. The bikes evacuate wounded from the front, bringing rocks on the return journey. When stones run low, the police launch a barrage of tear gas and charge, forcing us back 50 metres. A counter-attack regains the same ground. Block by block, back and forth, this battle continues for six full days, night and day. Tahrir itself is heaving, barely 200 metres from the frontline. The level of spontaneous self-organisation is on a scale rarely seen in Britain. One million people pack the square and adjoining roads, squeezed in tight. Lines of people hold hands to keep pathways clear for ambulances to collect the wounded. Chants rise from different areas ‘Bread, Freedom, Social Justice’ and ‘Down down with military rule – we are the people of the red line’. Discussion is everywhere. When two people start to talk, a crowd forms to listen and join in. But nobody is put on a pedestal. The protesters have not allowed any stages to enter the square, so there are no speeches from leaders. Boxes of gas masks, bananas and molotovs are carried forward to help those fighting. Medics stand ready with vinegar and saline solution to spray – sometimes too eagerly – into your eyes. Others break up pavement into rock fragments that will fit in your hand. Even here, the air remains thick with the acrid taste of stale teargas after days of bombardment. People nearby keep collapsing, unaware that the gas is slowly limiting their breathing. After the six day-long battle of Mohamed Mahmud in November, the revolution has more than 40 new martyrs. Many thousands were injured by the police violence, including 80 who lost eyes. Then, a month after the ‘Milioniya’ November rallies in Tahrir, the army attacks and burns out the continued sit-in picketing parliament. Tents are turned to ash with flamethrowers. To prevent protesters returning, soldiers bombard anyone approaching with paving slabs, crockery, molotovs and sheets of glass – all thrown from the 12th floor of the parliament building. Despite the rain of missiles, protesters attempt to hold the nearby streets. In the middle of the night, the army charges over a cement block wall it has constructed across a busy road. 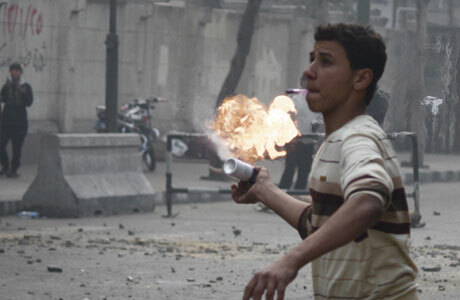 As soldiers pour into Tahrir, continuous machine gun fire forces protesters to rush for shelter. But the military fails to take full control of the square and is soon pushed back behind the wall again. In the surge forward, people confiscate batons and shields, body armour and helmets. Egypt’s elections have provided a sickening backdrop to the violent repression of the revolutionary movements on the streets and in prisons. The media celebrated the most free elections in many decades, hyping ‘the successful transition’. But turnout has been low and violations were blatant and common, although not on the scale of Mubarak’s election-rigging. Results have been dominated by the Muslim Brotherhood, who are opportunist, pro-market and the largest organised force in Egypt; the Salafi Nour Party, ultraconservatives bankrolled from Saudi with a network of mosques and underhand support from the army; and the Egyptian Bloc, a largely neoliberal grouping financed by cement and media mogul Naguib Sawiris. Many on the left opposed holding elections while military rule continues, especially given the recent intense attacks on street protests. The resistance against the Supreme Council of the Armed Forces (SCAF) junta combined with a lack of financial resources explains why the ‘Revolution Continues’ bloc fared badly in elections. The elections have legitimised the junta’s rule and its supposed ‘transition to a new Egypt’. The army leadership desperately wants to hand over day-to-day government, while dictating the terms for its retreat back to being the invisible power behind the throne. It hopes to constitutionally guarantee its autonomy and impunity, its finances and web of corruption, while maintaining the ability to intervene when desired. This requires a careful balancing act with the Muslim Brotherhood – the two are competing for power, but recognise their shared interests – and their shared opposition to a continued popular and grassroots revolution. The junta’s response to protests demanding its immediate dissolution has been to offer limited concessions, usually to the Brotherhood, alongside violent repression on the streets, attempts to incite sectarian violence and the active demonisation of leftists as controlled by an invisible, foreign hand. Meanwhile, the military still receives £850 million in US military aid annually, and Saudi Arabia siphons hundreds of millions of dollars to the Salafis. Despite its brutal attacks, the military manages to maintain widespread public trust through its tight control over terrestrial TV and radio stations. Without access to mass media or a network of mosques, the left has struggled to publicise its positive demands and values – values with mass support across the country, contradicting the media’s portrayal of ‘increasingly isolated revolutionaries’. Most Egyptians oppose privatisation and neoliberalism after past experiences of World Bank-imposed structural adjustment and Gamal Mubarak’s privatisation programme. Workers, leftist lawyers and NGOs have begun forcing renationalisation through the courts. Egypt’s new independent unions have been characterised as the largest social movement in north Africa since the Algerian revolution. The September strike wave involved many hundreds of thousands in collective action. Aware of the potential of the leftist momentum behind the revolution to fundamentally transform Egypt, the junta and Brotherhood are both deploying a rhetoric demanding ‘stability’ – something Mubarak was always great at providing – and framing those demonstrating in Tahrir as isolated. These calls for peace and quiet – and an end to the uprising – are actively supported by the World Bank, foreign governments and major multinationals. The revolution belongs to Egyptians, but solidarity and joint struggle are essential. The gas that kills protesters in Tahrir is produced in England as well as the US; the debt owed by Egypt includes £100 million to the British Export Credit Guarantee Department; and the largest foreign investors are BP, Shell and BG (formerly part of British Gas). Despite the aggressive counter-revolution – both physical and discursive – the battles for Egypt’s future are not over. From Tahrir itself to the textile factories in Mahalla, from the fenceline communities resisting polluting factories along the Mediterranean to the football-supporting ‘ultras’ battling their way into the stadiums, Egypt’s social movements are still fighting and dying for freedom and justice.